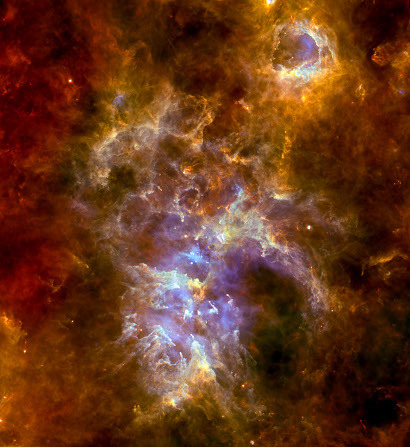 A new image from ESA's Herschel Space Observatory reveals the glowing clouds of gas and dust in the Carina Nebula complex, one of the most massive stellar nurseries in the Milky Way. The image provides a new view on this star-forming region at far-infrared wavelengths, disclosing the intricate structure of filaments, pillars and bubbles that pervades it. Carved by winds and highly energetic radiation from massive stars, these features recount the history of star formation in the nebula: a result of the delicate balance between stellar feedback effects that may either halt or trigger the production of new generations of stars. A site of intense star formation, the Carina Nebula complex is home to some of the brightest and most massive stars in our Galaxy, the Milky Way. The intricate network of clouds that populate this prolific cosmic nursery, where tens of thousands of new stars are forming, is revealed in unprecedented detail in a new image obtained with ESA's Herschel Space Observatory. Observing the sky at far-infrared wavelengths, Herschel enables us to see the glow of cold material, such as the mixture of gas and dust that pervade the Carina Nebula complex. The image combines data acquired with the PACS instrument at 70 micron (shown in blue) and 160 micron (shown in green) and with the SPIRE instrument at 250 micron (shown in red). As seen in the image, the complex exhibits a rich assortment of bubbles, filaments and pillars, and the various regions of the nebula span a wide range in densities, from diffuse and loosely bound areas to more compact concentrations of matter. Partly responsible for creating this tangled structure are the numerous high-mass stars hosted within this star-forming region – in the central region alone, the Carina Nebula boasts a census of more than a hundred very massive stars of type O, B and Wolf-Rayet. These include the famous Eta Carinae, a Luminous Blue Variable star with a mass over 100 times that of the Sun; this highly unstable star gives rise to frequent and violent outbursts and is expected to explode as a supernova in the next few hundred thousand years. These mighty stars, which infuse their surroundings with powerful winds and large amounts of ionising radiation, not only contribute to shaping the nebula's appearance, but also have a significant impact on the star formation activity that takes place within it. The feedback from massive stars has a twofold effect on their neighbourhood: matter may be blown away, dispersing the clouds and halting the production of new stars, or clouds may be compressed, thus triggering further episodes of stellar formation. It is the balance between these two opposite aspects of massive-star feedback that determines the past, present and future of star formation in the Carina Nebula complex. In the central portion of the image, where several stellar clusters host young, massive stars, feedback effects have cleared out the region, and the diffuse material there shines brightly at the shortest of the wavelengths probed by Herschel (hence the blue-white glow that characterises this portion of the image). The impact of high-mass stars is revealed also in the upper part of the image, where a series of large bubbles have been carved by winds blown by stars at their centre. The most prominent of these bubbles, named Gum 31, is visible at the top right corner of the image; it is the result of feedback from massive stars in the young cluster NGC 3324 hosted within the bubble. At the lower left part of the image a large number of elongated structures, called the Southern Pillars, can be seen. At the base of these pillars, the mixture of gas and dust is extremely dense, highlighting that in this region of the nebula the feedback from massive stars has caused the material to concentrate in several compact clumps. New generations of stars will eventually emerge from these dense blobs of matter. A pronounced dark region is adjacent to the right edge of the Southern Pillars: the origin of this bubble-like feature is unclear, as the stars hosted there are not massive enough to have sculpted it with winds. Astronomers believe that it might have been caused by gusts of hot gas leaking from the powerful stars at the centre of the nebula. By combining data from Herschel's different channels, it has been possible to estimate the temperature of the cloud material across the Carina Nebula complex. The mixture of gas and dust giving rise to emission at the far-infrared wavelengths probed by Herschel has temperatures that range from 40 K – at the centre of the nebula and inside the Gum 31 bubble – to less than 20 K in the peripheral regions, and its total mass amounts to about 650 000 solar masses. However, the presence of high-mass stars that heat up the cloud material clearly indicates that a larger amount of gas at higher temperatures pervades the complex. By taking into account this warmer component, which is not detected by Herschel, the total mass of the nebula is estimated to be around 900 000 solar masses. Image Orientation: North is about 15 degrees counterclockwise of the vertical direction; East is 90 degrees counterclockwise with respect to the North. Acknowledgments: Open Time Programme: "Under pressure: Revealing the thermal and spatial structure of strongly irradiated clouds in the Carina Nebula, the nearest laboratory of massive star feedback"